So I am having fun cleaning up this old mold Zvezda 1:200 French Frigate kit, and the other day I got around to finish adding a curve to the otherwise flat deck (original kit part). The effect is very subtle, but I think after adding some gloss coat and varnish to the deck later, that the effect will be noticeable. 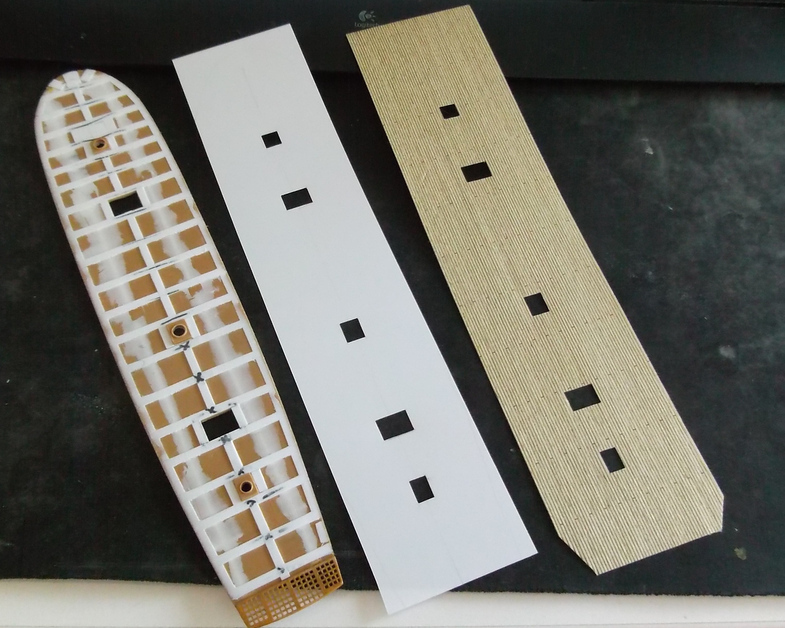 I was glad to see that Mk1 Design are selling sheets of wooden planking, that you can cut out yourself, which is nice when there are kits that doesn't have aftermarket wooden decks made for them. 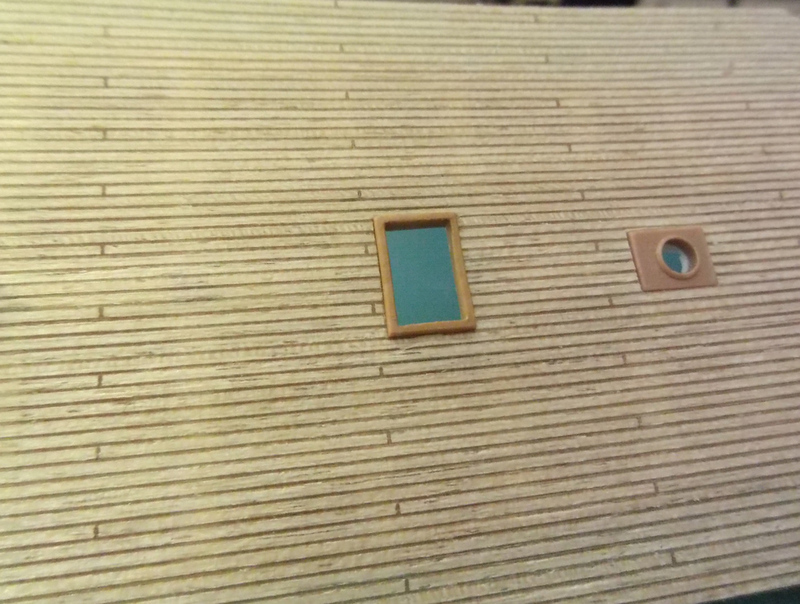 The deck sheet I chose has 1.2 mm wide planks, which seems about right for this 1:200 scale frigate model of mine. Ideally, I wish the styrene would be gray, so, because of how the white styrene shines through the wooden deck (seen somewhere below) I will add a gray or black primer to the deck before adding this wooden deck that is self-adhesive. Hm, I suppose there is some risk that, because of the painted surface, and the curved deck and the self adhesive, the deck could come unglue so to speak, though I plan to add styrene that clamps onto the deck that will prevent that from happening. Note the height of the curvature is less than 1mm, probably 0.5-0.6 mm. The cannon below (I have 50 of them), is made of 15mm brass barrel + 1mm or maybe it was 0.88mm wide styrene rod + 3D printed cannon carriage from Shapeways (printed as two sprues with 26 carriages on each). Unfortunately, after buying the brass barrels, they were supposed to have the pins in metal (as per photo), but they didn't, and there was only one hole, on one side, and I went through 5 drill bits finishing drilling the hole on the side, on all damn cannon barrels. :| I suggest not simply trusting product photos and better ask the seller about the quality first. The size of the cannons might be a tad out of scale, being a little too large and I was not able to find smaller brass barrels. On the other hand, the one piece cannons in plastic that came with the kit, seemed to be much too small. Admittedly, gluing on the sheet of white styrene there, was a little tricky, as I was only using Tamiya's Extra Thin Cement, which evaporate quickly, but it was ok, gluing on the white sheet of styrene, one bit at a time. I think it was a good idea to create this white styrene sheet, with its perforations, before trying to cut out the holes for the wooden deck, as I used the sheet of white styrene as a more or less rough guide, and I think the result is good. The wooden deck seen below is not yet glued on, so the plastic deck isn't perfectly sticking out through the perforated wooden deck there in the photo. 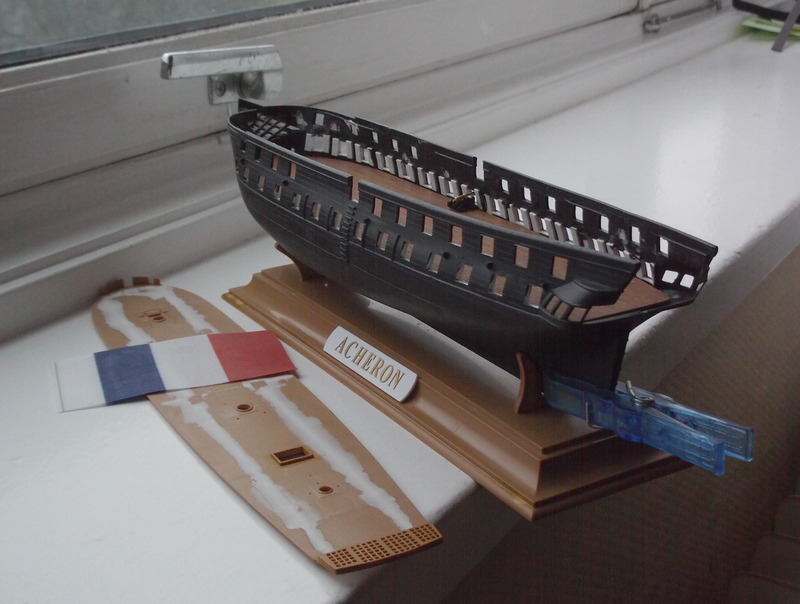 Some other photos of the ship model. Taking my good time cleaning it all up, and correcting the alignment of all the some 50 holes, though the bottom rows with 25 holes or so, are placed fairly well just having to clean off the super heavy flash and uneven plastic. I had fun adding bits of styrene adding this illusion of thickness to the ship hull. I will have to do the same at the top deck, like with the lower cannon deck. After this photo below was taken, I have cleaned the shapes even more. I already painted the lower cannon deck this way, and it looks great. It will be a good idea to paint individual planks on a first pass to get a light color, then add a second pass on some planks to get a darker look in places, to make an interesting texture to the deck. There are submarines, and targets. I've never built a sailing ship, but this is making me think again. "I rather believe that time is a companion who goes with us on the journey, and reminds us to cherish every moment... because they'll never come again." I think most sailing ship kits look boring, because they either too old, or too modern, but this one seems just about right imo. A plain frigate. I think I have seen smaller ships that also look interesting. I added some color to the deck (wood + mahogany + a little bit of flat red). Note, the wooden deck is here still not glued onto the large deck kit part, and also the wooden deck here is not cut fully into shape to match the kit part. I first painted on a more light layer on the entire deck with a larger flat brush, then I added more paint per plank here and there, and these became darker in hue. I wish I didn't add the darker hue to this many planks, as the entire deck looks dark now. In hindsight, the safe this would be to add just a little, and then, you can spend the next day wondering if you want to add more darker planks, ofc you will have to mix the paint up again. If adding a gloss coat, then maybe a good idea to add some not-too-dark-wash for the spacing of the planks. How thick is the wood? I keep looking at doing real wood deck on some ships but keep thinking its going to be too thick and look not right. In the case of this particular product from MK1 Design (presumably there are differences between this one and others from other brands that I am not familiar with), my el cheapo digital caliper shows the wooden deck + super thin film covering the self-adhesive, to be 0.3mm. So, adding this deck adds a little extra height, but only a little. Looking at this other Pontos wooden deck product with pre-cut parts (I suspect the wooden deck there is pre-cut), it sort of looks the same, eyeballing it. Less then 0.5 mm thick incl. that thin film protecting the self-adhesive. Hm, same with this other Wood Hunter product I have for the Eagle cutter sailing ship in 1:350 scale. It sort of looks like less than 0.5 mm. So, adding a wooden deck does add a thickness to it. 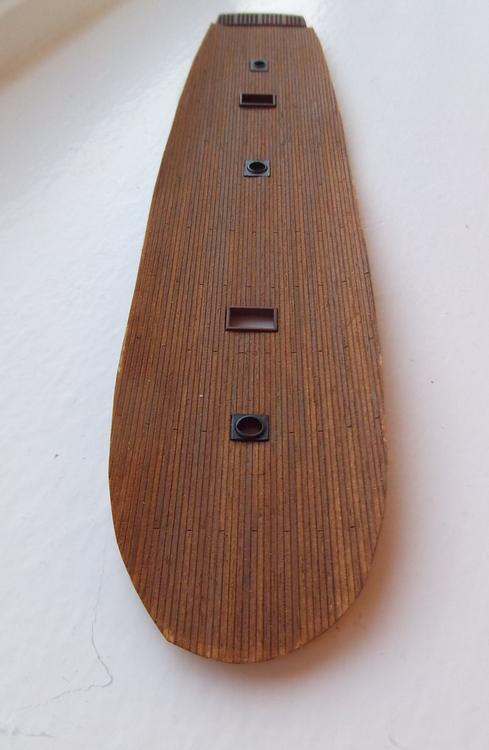 Here is a close up photo of some Mk1 Design wooden deck that has already been stuck properly to the kit part. The wooden deck there is the thin dark line on top. The ruler there showing millimeter increments. I guess I should add that, for this particular kit of mine, in order to more easily put on this wooden deck, without having to cut out more holes than needed, I carved off some eh 10 details that will be replaced afterwards. Depending on how good or bad it might look adding these back plainly on top of the wooden deck, I might consider cutting some more holes, but I'd rather not. In the image below, one can see one of the larger parts that I did not bother making a hole for, lying casually on top of a flat deck (lower cannon deck, as a quick illustration only). Looking carefully, it might look like it is floating because the darker spacing between the planks seem "create" a little bit of space underneath the part. It could look better when actually glued on, but not much better, as it lies flat at it is. I will consider very carefully cutting out more holes because of this. I only have two such parts, so I may do it for them, but not the other 10 smaller parts that also is to be glued on top of the wooden deck. I did this so that I don't have to cut a bazillion holes into my wooden deck. This kind of wooden deck is fragile, so don't press your finger nail onto it, as it might leave a deep mark. The thin film on the backside makes it easy to handle the wooden deck before gluing it on. Once the film is peeled off, the deck will start to snap if you put stress to it. Interesting. Reason why I ask is cause I got a Civil War Blockade Runner coming in and I am thinking of doing something like you are doing to make the deck look nicer. I don't have the model yet to see what kind of deck details there are but larger details they could be just simply sliced off and marked on the wood deck to be mounted on top of. Another option I thought about which I am not sure its doable is to shave the plastic deck down the thickness of the wood so it will sit right. But that might be too much work for questionable results. I would definitely recommend this chisel tool that trumpeter sell on ebay. Iirc, it comes in various sizes and shapes. Though make sure they are sharp before using it the first time, as mine seemed dull. Though, if having to strip an entire surface, then maybe sanding is the only way to knock the height and texture down. I am not sure what is wrong, but the self adhesive wooden deck on my very slightly curved deck, has a few areas that bubble up. Presumably, one flaw might have been me forgetting to clean the surface below with cleaning liquid, I am sure I forgot to do that. Secondly, I suppose, any stress on the sheet, like when not having the holes not cut large enough, might perhaps have the self adhesive coming loose over time. The severity of this issue is fairly minor, but a little annoying. Hm, I suppose one trick, could be to puncture the holes and add a tiny bit of liquid cyanoacrylate throuh the hole, and then press down. I had a similar issue with the wooden decking for the QM2 where it would lift off the surface. A little drop of CA applied with a tooth pick works well to stick it back down.